Veeam 9.5 Update 3a – What’s in it for Service Providers - VIRTUALIZATION IS LIFE! Earlier this week Update 3a (Build 9.5.1922) for Veeam Backup & Replication was made generally available. This release doesn’t contain any major new features or enhancements but does add support for a number of key platforms. Importantly for our Cloud and Service Providers Update 3a extends our support for vSphere vSphere 6.7, vSphere 6.5 Update 2 (with a small caveat) and vCloud Director 9.1. We also have support for the April update of Windows 10 and the 1803 versions of Windows Server and Hyper-V.
vSphere 6.7 support (VSAN 6.7 validation is pending) is something that our customers and partners have been asking for since it was released in late April and it’s a credit to our R&D and QC teams to reach supportability within 90 days given the amount of underlying changes that came with vSphere 6.7. The performance of DirectSAN and Hot Add transport modes has been improved for backup infrastructure configurations through optimizing system memory interaction. As mentioned, the recently released vCloud Director 9.1 is supported and maintains our lead in the availability of vCloud Director environments. Storage snapshot only vCloud Director backup jobs are now supported for all storage integrations tht support storage snapshot-only jobs. Update 3a also fully supports the VMware Cloud on AWS version 1.3 release without the requirement for the patch. One of the new features in Update 3a is a new look Veeam vSphere Client Plug-in based on VMware’s Clarity UX. This is more a port, however with the announcement that the Flex based Web Client will be retired it was important to make the switch. In terms of key fixes for Cloud and Service Providers, I’ve listed them below from the VeeamKB. 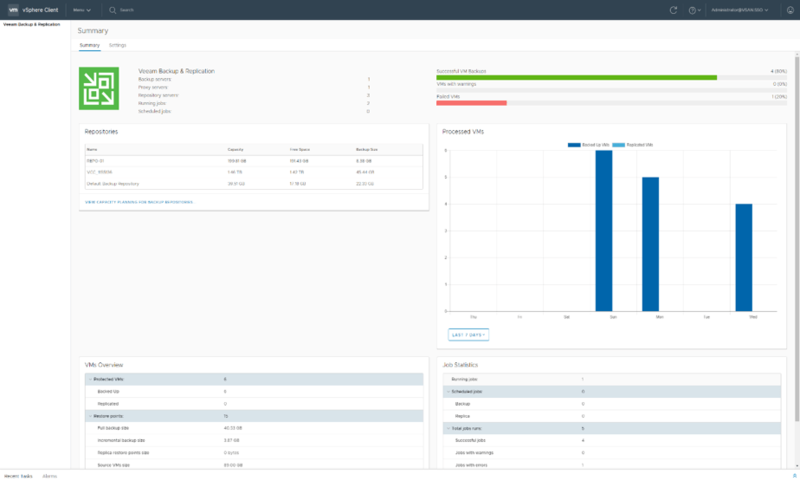 User interface performance has been improved for large environments, including faster VM search and lower CPU consumption while browsing through job sessions history. Incremental backup runs should no longer keep setting ctkEnabled VM setting to “true”, resulting in unwanted events logged by vCenter Server. Windows file level recovery (FLR) should now process large numbers of NTFS reparse points faster and more reliably. Update 3a also includes enhancements and bug fixes for cloud and service providers who are offering Veeam Cloud Connect services, For more information relating to that, please head to this thread on the Veeam Cloud & Service Provider forum. A reminder as well, that if you are running Cloud Connect Replication you need to be aware that clients replicating in on higher VMware VM Hardware versions will error out. Meaning you need to either let the customer know that the replication cluster is at a certain level…or upgrade to the latest version…which is now vSphere 6.7 that gives Version 14. For a full list check out the release notes below and download the update here. You can also download the update package without backup agents here.